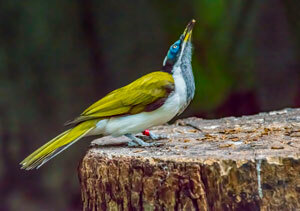 Blue-faced Honeyeaters Flock the Zoo! The Milwaukee County Zoo welcomes a male and female blue-faced honeyeaters to the Herb and Nada Mahler Family Aviary! New to the Zoo, the blue-faced honeyeaters live in East Flight, a walk-through exhibit with live foliage and water features, home to 14 different species and 74 birds. Known locally as banana birds, they are from Australia found in open woodlands, parks and gardens. The pair is from Nashville, born at Prague Zoological Gardens. The male is about 4 years old, and the female is just over 1 year old. The female blue-faced honeyeater is the offspring of the male. Blue-faced honeyeaters get their name from the brilliant blue color, ranging from pale blue to cobalt, which is actually skin and not feathers. They have black and white bodies with olive-green wings. They do great in pairs and co-parent, raising one or two offspring during breeding season, which is from August to January. Blue-faced honeyeaters use abandoned nests from other bird species, modifying the nest with new lining and materials. If they build their own nests, they use bark to create a rounded cup lined with finer bark and grass. Favorite foods of a blue-faced honeyeater are apples, a paradise fruit mix, and bugs (live crickets, mealworms and waxworms). An important pollinator of many Australian flower plants, they have a long tongue with a brush-like tip, which is used to get nectar from the flowers and can extend into the nectar about 10 times per second. Blue-faced honeyeaters are one of the first birds heard in the morning, usually 30 minutes before sunrise. In the wild, Australian farmers think of these birds as being pests in orchards, because they eat the apples and bananas. Visit the Aviary to welcome our newest residents, the blue-faced honeyeaters and search for the birds with the brilliant blue around their eyes!